Boy, oh boy. Here’s the best deal going on those jaw-droppingly large universal remotes that your grandpa used to switch between Matlock and Wheel of Fortune. Woot.com is selling not one, but two — two! 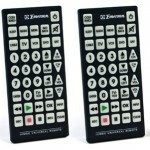 — gigantic remotes for just $5, plus $5 shipping. So in the event that you somehow manage to lose one, which would be damn near impossible, you’ll have another one at the ready. Or use one in the living room and the other in the bedroom, keeping in mind that it’ll take up about as much space in your bed as an actual person and rolling over on it in the middle of the night may necessitate a trip to the hospital. The remote itself controls up to eight different devices. However, if you’re in the target demographic for this thing, you probably own a single TV and one of those newfangled digital converter boxes. And cats. You own many, many cats.